Our specialist computer-cut vinyl means we can sign write onto almost any surface, in almost any size or shape. If you have a unique requirement, or a tricky challenge to solve, please do call us ; we‘d love to help. Our equipment prints up to 1350mm in width. It prints with very high definition, meaning that photos print without graininess or blurring. It also cuts to shape with high precision, enabling us to create signs for almost any situation. Business exhibitions are a great way to meet new customers. Unfortunately they are also busy, crowded and noisy. The solution is a Display Stand from Track One Graphics. 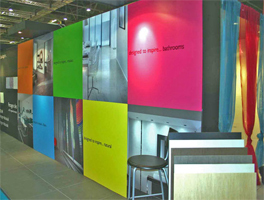 We help you attract visitors to your display, and make an excellent first impression. As for all our work, we can use your existing artwork or create something entirely new. Our stands are all quality products from well known manufacturers, and come with a manufacturers guarantee. We create colourful, attractive banners. We will create powerful and persuasive graphics for you, which can include high-definition photos. The graphics are printed onto banners of any width up to 4‘ ( 1220mm ), and any length at all. The banners are printed onto vinyl or canvas. We use top quality materials and solvent-based inks, so the signs have a vibrant full colour, and stay looking great for years. They are tough enough to be used outdoors for long periods. Outdoors our banners are ideal for attracting attention at special events. Indoors, they can make your exhibition or seminar presence come to life.